When I became a homeowner I started saving jars, being both crafty and thrifty this just seemed like a natural habit to begin. I suddenly had cabinets to keep them in and a host of projects in my mind that I could someday do with all these jars. I have used them for gifts, storage, and decorations. Each time I create something with an old jar I think how glad I am that I saved it. 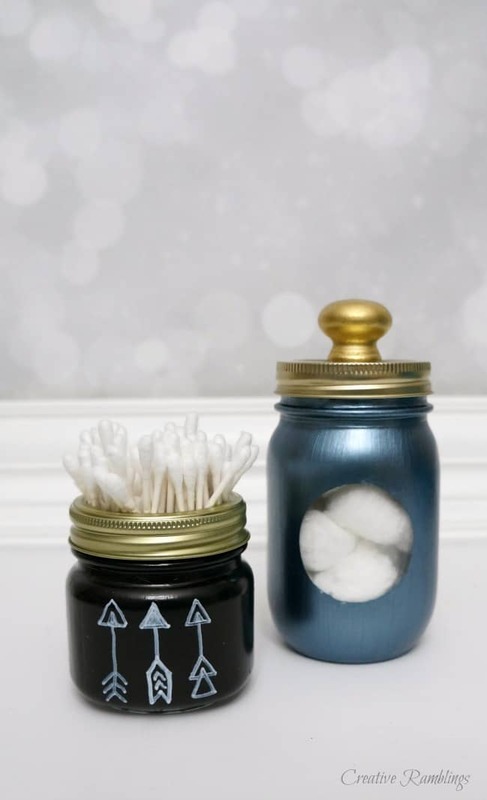 This past week I shared some mason jar storage ideas on The Morning Blend (click the link to watch the segment) and I got such a positive response that I wanted to share all the details on the bathroom storage jars here. Pin this Mason Jar Storage now so you can recreate it later. 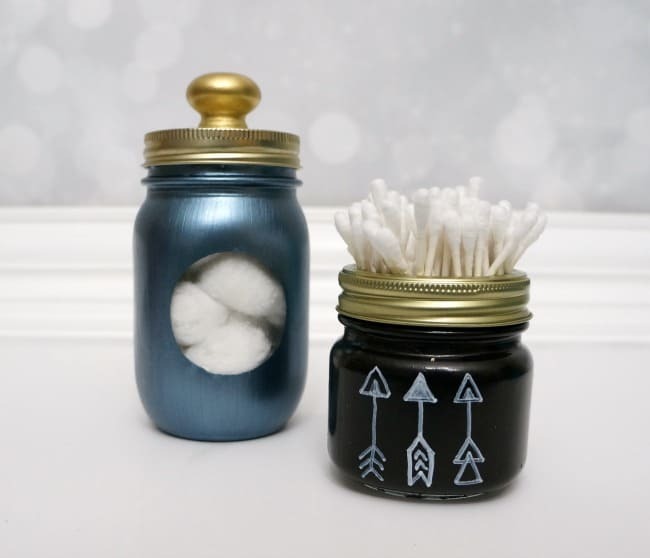 I used 2 jars, of varying size, to create pretty containers for cotton balls and Q-tips. I currently have very large hard to open containers in our main bathroom but they take up so much space and my daughter has a really hard time opening them. These smaller containers are not only easier to access, they are much more pleasing on the eye. Here is what I used for this Mason Jar storage project. This project is part of a fun monthly Craft Destash group. We create projects using items we already have. I didn’t have to buy anything for this mason jar storage project, all the items were in my craft room just waiting to be used. Be sure to check out the other blogger projects at the end of this post for more crafty inspiration. 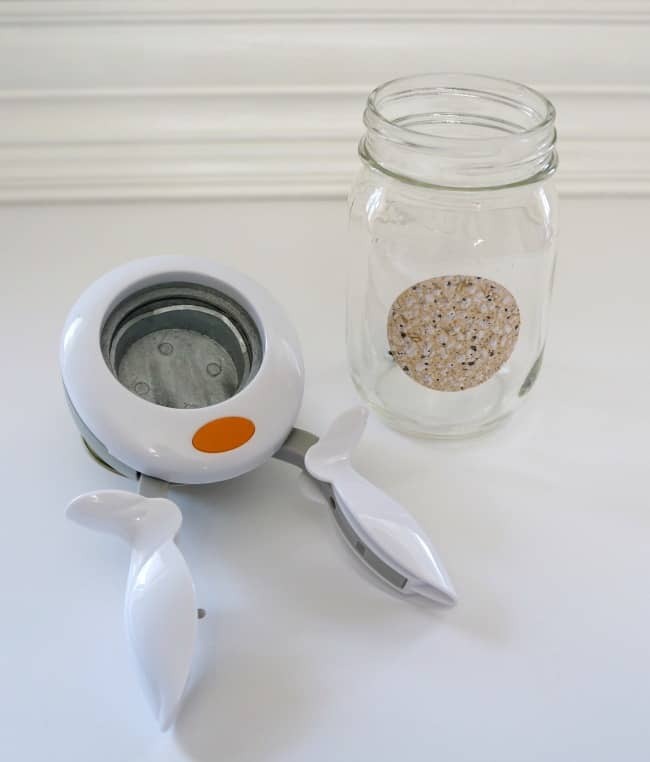 Step 1: Use a circle sticker, or punch a circle out of contact paper, and stick it to a clean jar. Then paint over the sticker with Pewter paint. Once this is dry, remove the sticker. 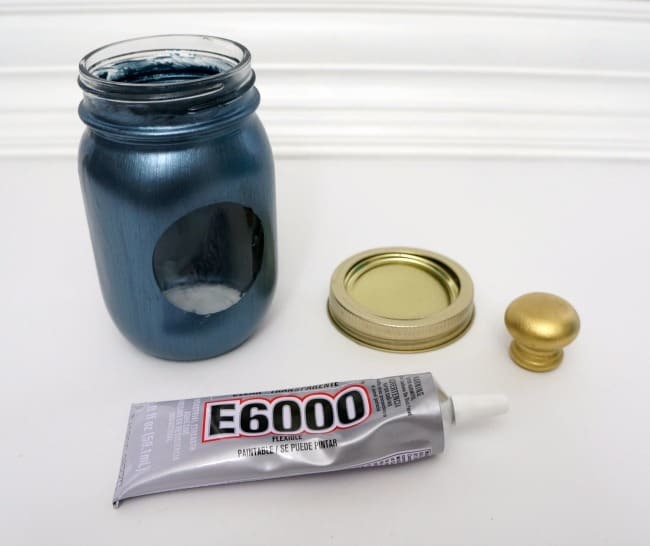 Paint the smaller jar black and let that dry as well. Step 2: Glue the 2 pieces of the mason jar lid together using E6000 adhesive, and glue the knob to the top. For this project my knob was already gold, if your items are different colors you will want to spray paint them all one color. This can be done after everything is glued and dry. 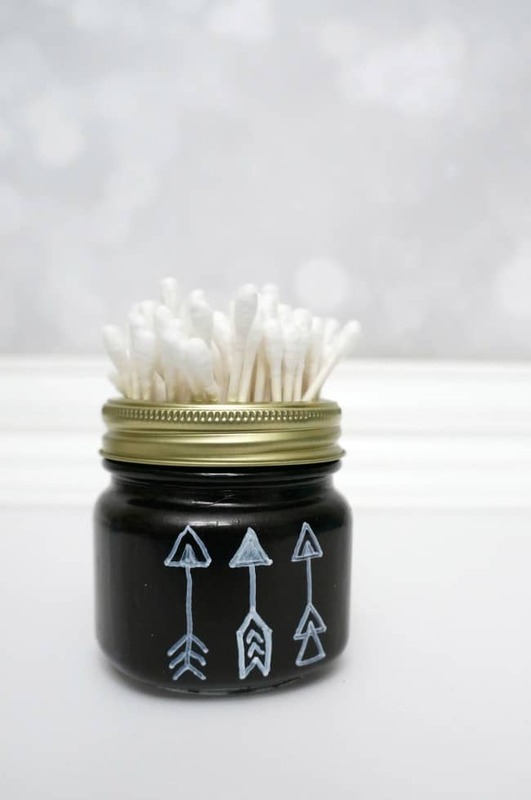 Step 3: Once the black jar is dry, get creative with a paint pen. I drew a few arrows on mine. Step 4: Once everything is dry, fill with bathroom essentials and display. This modern and fun mason jar storage for the bathroom was so easy create and it didn’t cost me a thing. For more crafty inspiration be sure to check out the posts below. 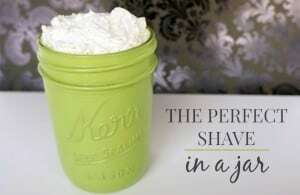 Here are more mason jar posts you might like. Hey Sarah, what a great de-stash project! I love that idea…I shudder to think how many projects I could make with all the ‘stuff’ I have sitting in my home right this minute…yet I am inextricably drawn to Michaels on a weekly basis. ? And cutting out that little hole so you can see what is in the jar! Very clever…well done my friend. Thanks for the fun tutorial and for prompting me to think of what I have in my home when I feel the need to craft. It’s amazing what you can do with the supplies already on hand, but I share your love of Michaels! Thanks for stopping by today. I love using mason jars for storage. I am going to have to look for the smaller ones now! The arrows you painted on the jar are cute! These are gorgeous! I have a ton of jars that I use randomly (not all at once, either.) And I have shelves in our main bathroom these would be perfect on. I just need the paint! Sarah….these are so great. Thanks for the inspiration. I love that metallic blue paint. I’ve never used it before, but it looks so nice! I love them! 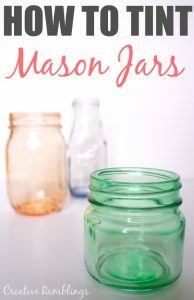 I am planning some Mason Jar posts soon and will include them for sure. Love the colors you chose too! The metallic color on the glass looks awesome! Great project idea! Mason jar crafts are so fun and there are so many ways to paint/decorate to match your decor. I love the dark paint and arrows for a kind of boho look. These look great. 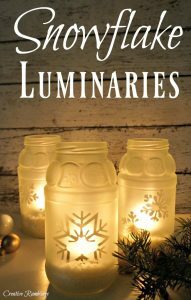 I love using mason jars, I have a whole collection I’ve collected from yard sales for craft purposes! 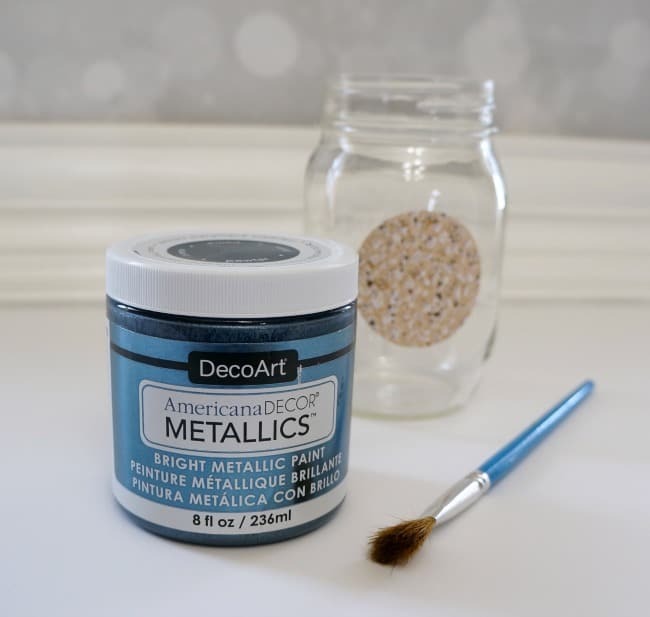 I LOVE the DecoArt metallics line, so great aren’t they! This is a great project, and what a fun and pretty way to store your little items and use the items you already have on hand to create this project! Pinned! Thanks Molly, I too could use these metallics all day! Such a great idea! I love the colours that you chose! The possibilities are endless! Thank you for the inspiration! You are welcome Sam, thanks for reading. I love how these turned out Sarah. Mason Jars make such great storage containers and you know us crafters always seem to have some on hand, lol. Yes we do, but it’s a good thing. Thanks for stopping by today. I love that metallic paint you chose. It’s so rich and elegant. Love this project. Cute idea! I love the peekaboo effect of the majon jar! Nothing like a Mason jar craft! Love these! Very cute idea! I love reusing jars for tons of other things around the house! 🙂 Love that blue paint color you chose. What a great idea. I really like the colors and design.